TFP gives you the methods and materials so that you can learn English in the most effective way possible. Click Here to Join the Program Today! You can go through the video tutorials as quickly as you can. But I recommend spending 10-15 minutes a day using the methods. You can do more but start with 10-15 minutes. I want you to do this consistently. That’s key. Can I speak with you on Skype? That’s not what this program is about. I give you the methods and materials you need so that you can improve on your own. I’ll also show you how to get natural practice too. But that’s not the focus. The method that you’re going to use is powerful. You’re going to dramatically improve your speaking, fluency, and general English. But you have to actually do it. I want students who are going to commit 10-15 minutes a day to this. If you can do that, sign up here. 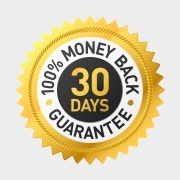 You can get a refund within 30 days. Send me an email and tell me why. But I need to move to an English speaking country, right? You’re just giving yourself an excuse. Look: I’ve met a bunch of people who moved to Asheville (where I live in America) a long time ago and their English level is still very low. I know others who speak beautifully but have never been to an English-speaking country before. Do the right things – no matter where you live – and make consistent progress. Or 12 payments of $29. Think about how much money you spend – or could spend – on intensive courses. On language schools. On other courses that don’t really make a difference. This program is one of the smartest investments you can make. Think about the return you’ll make – financially and personally – when you take this program and start speaking with confidence. But this program won’t just save you money. It will save you time. You are going to become a highly effective English learner. Everyone has their own reason for wanting to reach a high level. Whatever yours is, this program is here to help you finally achieve that no matter how busy you are or where you live. Hi Jack. I loved your course because you explained everything so clearly and professionally. I am following your advice and it’s working. Thank you so much. I highly recommend “ The To Fluency Program.” Jack is such a lovely, and more importantly, an incredible teacher. You’re going to enjoy his teaching without getting bored, and his methods for learning are the best. You’ll learn how to become fluent and I’ve learned so much from him. I felt motivated, focused and determined to achieve my goals since Jack made me feel like a confident learner. I just love the progress I have made! English learners: if you really want to reach an advanced level and speak fluently (and have a LOT of fun along the way) The To Fluency Program is perfect for you. Use Jack’s approach, take control of your learning, and actually make progress. Don’t hesitate to sign up! Hi, my name is Gema and I'm from Spain.I want to share my experience in learning English with you. I enrolled in the EOI of my city six years ago, I started to learn English in order to help my son, then, I felt (fall) in love with the language. Although, the road to get a high level in whatever you do is difficult, there are some things that work and others don't work. Well, to make a long story short, I want to reach my goal so, apart from going to my classes in the school,I usually look for some resources on the Internet. I don't have too much time to study, you know, I'm a busy person, but I found Jack. It was great, fantastic, amazing...He is helping me a lot, I do something in English every day, he has taught me how I can invest less time and go further, he has showed me how I must start believing in myself and I have no words to express my grateful.There is always something new to discover. The To Fluency Program and Jack have been my lifebelt this summer. I'm used to reading some testimonial in the comment sections of websites and I always think that they are lying, and now, I'm here writing a post about how much this course helps me, it makes sense, because if I have found something that works, my desire is sharing it with everyone. I wish these words encouraged people to take the program. I am from Brazil and despite all the years of studying English at school, in private classes, with English books and traditional methods, I was not able to be fluent. So at the end of 2014 I almost gave up trying to learn, but then I found Jack and his methods. It is amazing how the tips, the steps and my mindset about the process of learning changed. Today I know how to study alone, how to make it interesting, and how to assimilate the language and all the vocabulary I need for fluency. What is more unique is that Jack teaches more than English. He teaches how to make English part of you and your daily life. How pay attention and do things that I never did before. It is pointless to try to study if it is not fun, it then becomes a chore. At that point, you will either hate your studies or become afraid of them. I was afraid of it and I almost gave up. Jack save me like in Titanic - the movie. Literally in English. Jack made me understand why all the process of learning is important. It isn’t necessary to tackle all learning in the same way. Instead, you need to fit the learning to you, not you to the learning. Jack's method and program offered tips on how to plan my learning, find the right time and place, and not get distracted and give up. I am so grateful for Jack and his To Fluency Program. I believe this program will make a HUGE difference to your level of English. It’s the most effective way for you to reach a stage where you’re speaking with confidence. I’ve put my years of English teaching, research, and my own language learning into making this program for you. If you are ready to make improvements, and if you are willing to commit 10-15 minutes per day using the most effective methods, I’d love to have you. Know that you’re covered by our 30-day guarantee. So, don’t wait. Click the button below and get instant access to the program.